Once again, another racing season has come to a close. It was a year full of great side by side racing, first-time winners and thriller finishes, some almost too close to call. For the final time, the IMCA Sport Compacts hit the track for their last feature of the year. When the green flag waved, Kody Stox en and Jason Berg battle for the lead. They raced door to door until Berg completed the pass on lap two. Stoxen got too high off turn two which allowed Chance Seelye to slip by for second. As Berg pulled away from the field, Stoxen was all over Seelye's rear bumper. Points leader Josh Roehrich started to reel in Seelye and Stoxen however with two laps to go, Roehrich suddenly lost speed. Bismarck's Brandon Anderson passed Roehrich for fourth bringing young Dylan Sandberg with him. 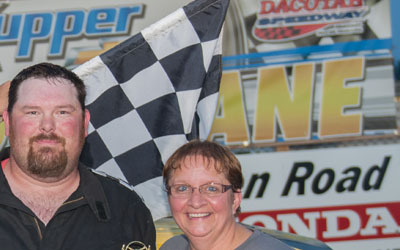 Roehrich held on to finish sixth and pick up his second track championship at the Dacotah Speedway. 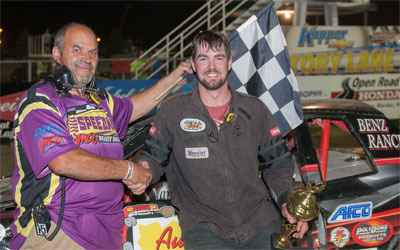 Kody Stoxen finished third as Chance Seelye finished a distant second place behind feature winner Jason Berg, his fourth victory of the season. After a complete restart, Kevin Bitz took the lead in the Hobby Stock feature. Bitz's lead was short lived as John Gartner Jr quickly took the lead on lap two. Gartner Jr pulled away after a lap thre e restart as Bitz and Keith McCleary battled for second. Bitz got loose off turn two which allowed McCleary to slip by and points leader Wyatt Rath-Wald to pull up along side for third. Rath-Wald cleared Bitz for the position, bringing Brent Vetter with him. Vetter had his hands full with a strong Jaren Wald. As they raced hard for fourth, they started catching Rath-Wald. It was a three car battle for third as Vetter dove low under Rath-Wald. Wald took it three wide before Vetter shuffled into third place. Rath-Wald's ill handling car fell to fifth as Wald was still all over Vetter's rear bumper. They raced side by side with two laps to go before Wald muscled by to take third as the white flag waved. Wald quickly caught second place McCleary but ran out of time. McCleary held off Wald for second as Vetter finished fourth ahead of first-time track champion, Wyatt Rath-Wald. 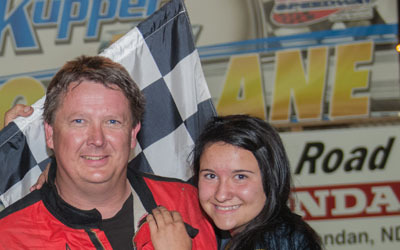 John Gartner Jr dominated the feature and won his third feature victory of the year. Pole sitter Nate Keena led the field to the green flag in the INEX Legends feature. Keena had his hands full with Steven Kuntz and Drew Papke all over his bumper. Kuntz found speed around the high line and powered into the lead on lap four. Papke and Troy Hoff briefly battled for second before Hoff took the position. Papke then fell into the clutches of fourth place Shane Williams. Williams, who started eighth, quickly passed Papke and reeled in second place Hoff. Hugging the guardrail, Williams passes Hoff for second and challenged Kuntz for the lead with four laps to go. They raced side by side for the win until Kuntz retook the lead with two laps to go. William's low line around the track gave him the drive off to take the lead again as the white flag waved. Kuntz threw his car hard into turns three and four one last time but the car bobbled, allowing points leader Donavin Wiest to drive up along side of him. Kuntz narrowly edged Wiest at the Open Road Honda finish line to finish second behind feature winner Shane Williams. 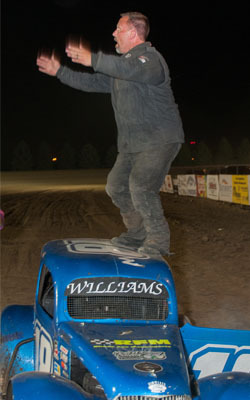 Wiest's third place finish clinched his seven track championship in a row at the Dacotah Speedway. Troy Hoff and Drew Papke rounded out the top five. Allen Frederick grabbed the lead from pole sitter Brad Hellman in the WISSOTA Street Stock feature. Cautions were early and often but Frederick continued to lead. Eric Harpole, who started seventh, challenged for the lead on lap six. They raced side by side until a lap seven caution reset the field. On the restart, Harpole dove low under Frederick. They continued to race door to door until Harpole completed the pass with nine laps to go. Frederick was now under pressure from third place Scott Gartner and Shawn Volk. They raced three wide until Volk shuffled into second. Lapped traffic wreaked havoc with the leaders late in the race. While battling for second, the lapped car of Charles (RD) Palmer tried to avoid the leaders and slammed into the side of Zach Frederick. Palmer's car got loose and he tried to save it from spinning on the front stretch. However, the rookie driver over corrected the car and rolled across the finish line before coming to a rest on John Weber's car. Points leader Scott Gartner and Zach Frederick collected heavy damage from the racing incident. On the restart, Volk and John Feist battled for second as Harpole pulled away. Harpole went on to win his second feature of the season as Volk held off Zach Frederick and Feist for second. 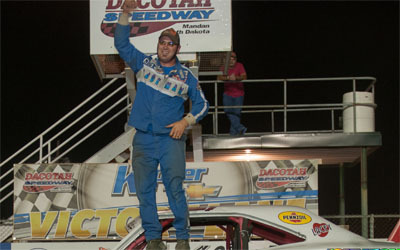 Chris Michaelsohn finished fifth and won his first track championship at the Dacotah Speedway. In the final feature of the evening, Brent Schlafmann took the lead before a lap two caution in the IMCA Modified feature. Second place Tyler Velo got loose on the restart, allowing Tracy Domagala and Rusty Kollman to slip by for second and third. Domagala quickly caught Schalfmann and powered into the lead on lap seven. Schlafmann fell to fourth as second place Spencer Wilson started to cut into Domagala's lead. Schlafmann retook third from Kollman, bringing Jerad Thelen and Shawn Strand with him. Up front, Wilson was all over Domagala's rear bumper. Wilson slipped by Domagala with eight laps to go and pulled away. The low line was the preferred line as the laps wound down. Fourth place Thelen slipped up the track with five laps to go, allowing Shawn Strand and Travis Ulmer to fly by for position. Strand was all over Schlafmann's bumper and cleared him for third with two laps to go. Schlafmann fell into the clutches of fifth place Travis Ulmer. As they came out of turn four and to the checkered flag, Ulmer passed Schlafmann for fourth. Shawn Strand's third place finish locked up the track championship, his third in the past five years. Tracy Domagala finished a season best of second place behind feature winner Spencer Wilson. Thank you to the fans in the stands for supporting your local race track and its drivers. We hope you had an amazing time at the track each and every week. Thank you to the drivers and their pit crews who came to the track week after week. Your love and passion for racing does not go unnoticed, thanks for putting on a great show each night. Thank you to all of the track officials and volunteers who sacrificed many nights away from family and friends. Without your commitment and your time, racing this season would not have been possible, thank you, thank you, thank you! We hope to see you all back at the track in 2016!